Click here to view our Easter, Valentine's Day & Mother's Day Product Guide! Click here for our brochure, where you can explore our product range! 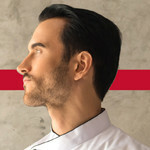 We combine inspiring, time-saving and high quality products with an exceptional service, enabling our customers to both innovate and increase productivity without compromising on quality. Do you have our Main Product Guide? 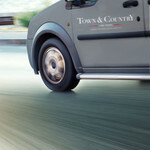 Contact us on 0345 672 8000 or marketing@tcfinefoods.co.uk for your copy! We're open Mon-Thurs from 9.00am-10.00pm, and Friday from 9.00am-5.30pm. 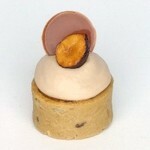 Hand-crafted mini dessert cup with marble blend of dark and white chocolate. 3 trays per box. 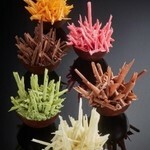 69% single origin dark chocolate. 12 trays of dark chocolate leaves per case. 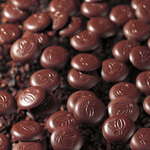 Due to the high content of cocoa butter, Felchlin couverture has a thin flowing viscosity, perfect for enrobing, moulding, pastry, ganache, mousses, pralines and luxurious dessert creations. 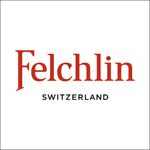 Felchlin are unique in their work ethic, where they personally know the farmers who cultivate the cacao beans they buy, regular check their working conditions and ensure they pay above and beyond Fairtrade prices. 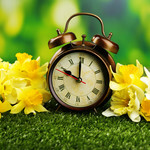 Click below to view our Easter Opening Hours. 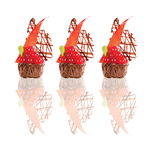 Following the growing success of our current range of mini paniers, La Rose Noire have created three new micro ‘bite-size’ paniers available in chocolate, strawberry and sweet flavours. 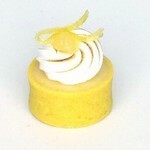 They can be filled with delicious fruit filling, chocolate ganache or creamy purée and decorate accordingly. These new micro ‘bite-size’ paniers offer consistent quality every time and are perfect for events, celebrations and banquets. 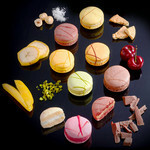 Need To Refresh Your Afternoon Tea Macaron Flavour Selection? 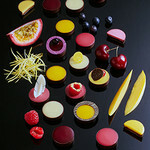 Introducing a fresh new flavour selection of La Rose Noire macarons featuring banana, hazelnut, cherry, speculoos, milk chocolate, pistachio, mango and coconut. These hand-crafted macarons are made using only natural non-AZO colourants, they are hand-filled with a delicious pâte de fruit and creamy mousseline filling, with a hand-splash finished design. 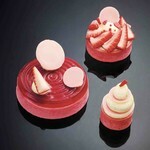 They are supplied frozen and will require defrosting for 8 hours before serving, offering consistent quality everytime. 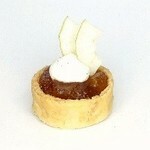 After the incredible success of the Mini Tartes Passion, La Rose Noire have launched an 8cm range of flavours in caramel almond, lemon, pear chocolate and apple confit. 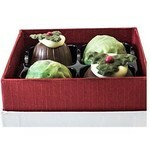 These hand-coated tart shells are double coated in chocolate and filled with each delicious recipe. 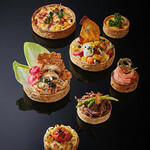 Using only the finest ingredients these individual tartes portions are the perfect addition to any dessert menu or fine dining experience. 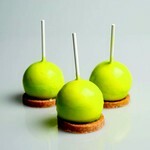 They are supplied frozen and will require defrosting for 4 hours before serving, offering consistent quality everytime. Inspired by nature, with their crystal-like design, this vibrant collection of hand-curled delicate curls is made from high quality couverture from the Philippines. Available in dark, milk and white couverture, plus three boldly coloured (orange, pink and green) white couverture options, they are perfect for adding a deliciously dramatic finishing touch to any type of dessert or sweet treat, the possibilities are endless. Supplied as 1 tray of 300g curls. Introducing Brown Butter tart shells, made with graham crackers, butter and cocoa to give them a rich, nutty flavour and appealing bronzed finish. Available in small (dia35mm), medium (dia55m) and large (dia80mm), these 17mm high bases take semi-finished literally, as they are supplied with a delicious almond base layer to enhance your lemon tart, cheesecake or fruit tart topping. Hand-crafted with a unique shape and geometric design, the Dark Chocolate Comet sits perfectly atop a Small Round Sweet LRN tartshell and is made with 69% single origin couverture. 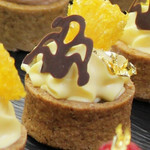 With its window-effect design, it can be used to dress any dessert and is perfectly paired with fruit or brightly coloured fillings for maximum impact. The 69% single origin couverture is from the South Philippines made predominantly from Trinitario beans which, after fermentation and drying, are roasted and conched for 48 hours to ensure a smooth taste. 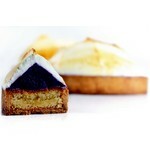 Using only natural vanilla, the flavour profile is nutty and floral with a strong chocolate base. 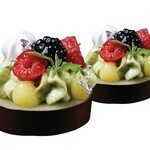 La Rose Noire’s latest décor items provide the ultimate decadence in café culture or are delightful as dessert decor. 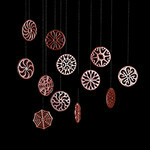 Made using 69% Single Origin couverture from the Philippines and available in assorted trays of 12 elegant designs, these intricate discs are particularly striking when placed carefully on the surface of a hot chocolate or cappuccino, taking a while for the dark dreamy chocolate to melt slowly into the drink. 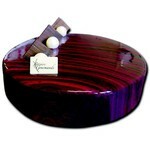 As a décor item (dia44m), they work equally well atop a filled chocolate shell, or semi-finished dessert. 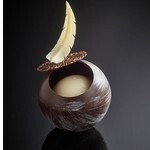 Receiving critical acclaim from its global launch to Pastry Chefs all around the world, this elegant and charming hand-crafted dessert cup has a delicate marble-blend effect of dark and white chocolate. La Rose is visually captivating and mouth-wateringly divine and can be filled with your own sweet recipe of mousse, sorbet or ice cream before decorating with fresh fruit or decor. Available in two sizes; medium (dia60mm) and mini (dia43mm), with every piece unique. 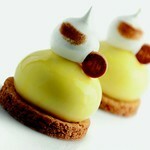 The Young Pastry Chef of the Year competition offers a chance to win The David Lyell Scholarship! Entries close in early February 2019. 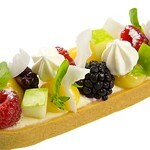 Les Milles-Feuilles Tartes have just arrived! 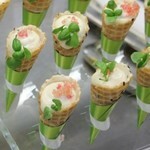 Hand-crafted and pre-baked for convenience during busy events and service. La Rose Noire have done it again. 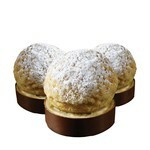 Les Milles-Feuilles, a range of pre-baked tart shells, are skilfully made using 24% high quality AOP Charentes-Poitou French butter and are ideal for sweet and savoury fillings. With a delicate neutral flavour and flaky texture, they are simple to prepare, offering a consistent quality and exquisite taste every time. Available in two sizes; small (Dia48 x H19mm) and large (Dia81 x H19mm), they are delivered frozen for ultimate freshness and simply require defrosting in the fridge for 4 hours in their sealed packaging. 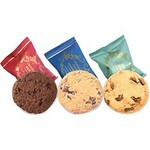 The Regency Selection is a delectable assortment of traditionally-made, pure butter biscuits. Exclusive to Town & Country Fine Foods, their beautifully designed twin-pack packaging makes them a superior choice for in-room amenities or board room meetings and the perfect tea-time partner for prestigious teas and freshly-roasted coffee. Three delicious flavours make up the selection; Oats and Sultana (a chunky and rustic biscuit that is crisp and creamy), Chocolate Chunk (a slim biscuit with a delicious crunch made with milk and dark chocolate chunks) and the Chocolate Brownie (a decadently chunky round shortbread with rich dark chocolate chunks and melted dark chocolate). 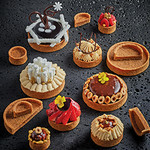 We are pleased to launch our 2018 range, spanning the traditional (mince pies, Christmas puddings and cakes) through to the contemporary (festive-flavoured tart shells, petites fours and décor items), plus a fantastic range of hampers, gifting and personalised options. Don’t miss our large selection of ‘long bars’ for their versatility, festive cookie selections to appeal to all, brand new décor items for a festive finish and hampers, stockings and chocolate figurines for treating your staff and customers. 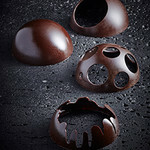 Introducing La Rose Noire’s Chocolate Universe chocolate shells range, for out-of-this-world desserts! 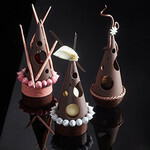 Premier patissier La Rose Noire have launched an exciting new range of chocolate shell designs made using their own 69% single origin couverture. 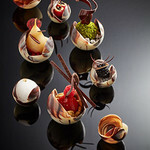 Their Chocolate Universe comprises four celestial designs; Globe, Moon, Galaxy and Crater, all exquisitely hand-crafted. 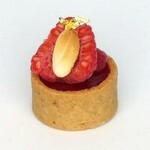 Serve alone for impact or transform into edible art by turning two into a sphere, or on top of a tart shell base. 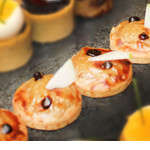 Each piece is available in two sizes, large (Dia80mm x H40mm) for banqueting or fine dining and small (Dia50mm x H25mm) for buffets and afternoon teas. 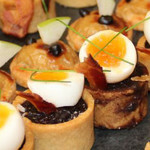 Looking for consistent and exceptional quality to meet your fine dining or banqueting needs? Look no further. An exciting new range of semi-finished frozen desserts made with a 69% single origin chocolate cup, using couverture from the South Philippines. 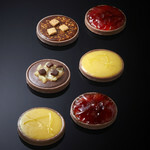 Hand-filled with a refreshing fruit jelly and topped with a delicious ganache, the bite-size Chocolat et Fruit desserts are ready for chefs to personalise with their own garnish. 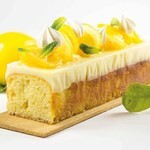 Available in a mixed case of 6 distinctive and divine flavours; lemon, passion fruit, mango, raspberry, cherry and blackcurrant. 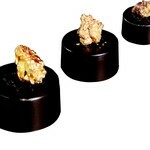 Perfect if you are seeking to make an impact with your canapes, buffet or celebration events and also ideal for petits fours. Delivered frozen for ultimate freshness (and convenience when short of staff), simply defrost in the fridge for 4 hours in their sealed packaging. Offering uncompromising organic quality, from bush to cup, Sirocco tea is carefully hand-picked from organic farms in the world's best-known tea-growing regions before being processed by experienced, passionate tea masters. They are then packed, by hand, into handcrafted tea sachets made from biodegradable materials. As members of the Ethical Tea Partnership, all Sirocco teas are manufactured under fair trade conditions and are perfect for in-room refreshments, conferences, banqueting or board-rooms. 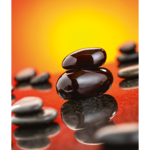 From Gentle Blue Earl Grey, Golden Assam or Japanese Sencha, to Moroccan Mint, Rooibos Tangerine or Camomile Orange blossom, our range of 13 flavours is available in boxes of 20 individually wrapped sachets and also includes a wellness range comprising Pure Power, Balance and Relax. 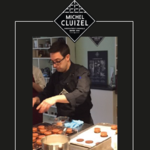 Customers of Town & Country Fine Foods joined us for a two-day Michel Cluizel workshop held in our development kitchen. 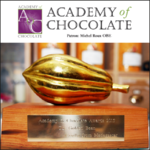 The Winners of the 2016 World Final of the International Chocolate Awards were announced on Friday at The Chocolate Show, London. 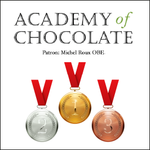 The International Chocolate Awards is an independent competition recognising excellence in fine chocolate. 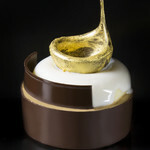 The judging panel is made up of renowned chefs, journalists, bloggers and chocolate specialists. 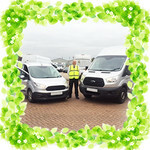 Congratulations to Felchlin and our award-winning customers. 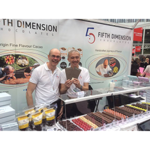 Congratulations to our partners, Michel Cluizel and Felchlin, and our customers Fifth Dimension, Berries, Melt and Winchester Cocoa Company!